New City – Kugane: Located within Hingashi, a Far-Eastern archipelago nation with a strict isolationist policy, Kugane is the only port city open to foreign trade vessels. New Dungeons: Many new and challenging dungeons, including Yanxia and The Azim Steppe, await adventurers in Stormblood as they explore the reaches of Othard. Additional Beast Tribe and Primal: The Ruby Sea is one of many new areas accessible on the continent of Othard, and home to the Kojin—skilled traders residing in underwater settlements who welcome dealings with other races. 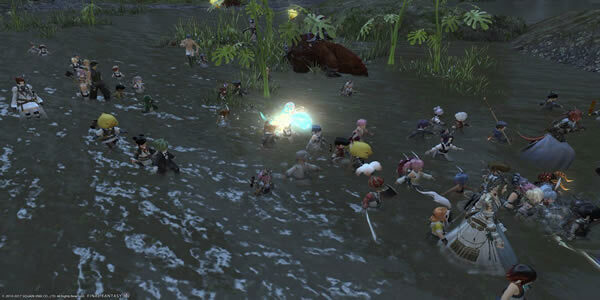 Residential Areas: The highly anticipated new residential area, Shirogane, was also announced. This housing area in Kugane brings an entirely new style of housing to players, featuring Far-Eastern style dwellings and wards. New Job – Samurai (DPS Role): Samurai joins red mage as one of the new jobs to debut in Stormblood. The katana-wielding samurai is a powerful melee attacker and master of Iai swordplay techniques who can store energy within their katana to unleash special attacks. Players in Final Fantasy XIV: Stormblood will not only join the resistance and fight for the liberation of Ala Mhigo, but will also be travelling to Doma and its surrounding areas in the title’s second expansion, Stormblood. Newcomers to the game can experience all available content up to level 35, create up to eight playable characters, and experience the different playable races, classes, and jobs with no restrictions on playtime. Be sure to check out our full review of?Final Fantasy XIV: Stormblood, find more at here.